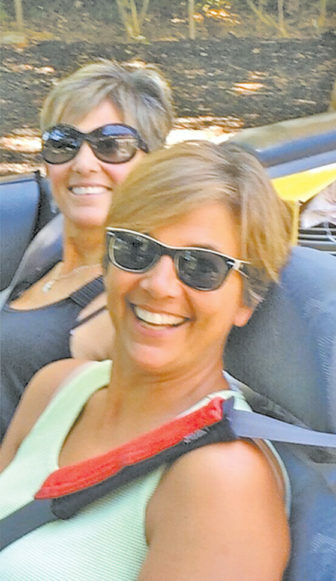 Roz Luongo is pictured at the wheel of her convertible with her sister Annette. Suffield resident Roz Luongo started something extraordinary. An extraordinary difference in a place where things truly matter, right outside her front door. Roz is the founder of the first Connecticut chapter of Neighbor Brigade, a community-specific network of volunteers that help residents facing sudden crisis and manage day-to-day tasks. She is now the co-leader, along with Laurie Meehan. Anything from meal preparation, rides to appointments, pet care (non-boarding) and basic household chores. It’s a simple concept of using web-based coordination tools, managing recipient requests and the recruitment of volunteers; all requests to be fulfilled sensitively, quickly and free of charge. It’s all done with the help of volunteers. Suffield volunteers. Roz has been hard at work recruiting Suffield volunteers, soliciting donations and getting the word out to busy residents. An advisor representing an anonymous donor from the Hartford Foundation for Public Giving recently contacted her. The Suffield chapter of Neighbor Brigade was given a small grant to help with the basic financial necessities of starting a new chapter. The Suffield chapter currently has 10 active volunteers. The benefit to volunteering for Neighbor Brigade, is the freedom and level of time one decides to volunteer. Volunteer sign-up service is done through the website (neighborbrigade.org). It only takes a few minutes and instructions are step by step and simple. Roz was motivated and inspired by the Bedford, Mass., chapter of Neighbor Brigade. Her sister, Annette, who lives in Bedford, has stage IV cancer. Last December was very difficult, both physically and mentally for her family and her. The Bedford Neighbor Brigade stepped up to assist with rides to appointments and meal delivery. Roz spoke fondly of her experience with Neighbor Brigade, “On a very special night, about 100 volunteers sang Christmas carols to my sister and her family on her front lawn. That group of volunteers helped out tremendously during a time of crisis in her life.” Roz is passionate and grateful for this simple non-profit that has provided so much support for her beloved sister. Neighbor Brigade began in 2002 in Wayland, Mass., by two women, Pam Washek and Jean Seiden. After Pam’s first bout with cancer, she decided to turn her experience into something with purpose by helping others. She and Jean (also a cancer survivor) first created Wayland Angels, to “pay forward” acts of kindness shown by their neighbors during their cancer treatments. Then in 2010, Pam incorporated Wayland Angels into the non-profit organization, Neighbor Brigade. This encouraged individuals to form chapters beyond Wayland to support their neighbors during serious illnesses or tragedies. To date, there are 29 active Neighbor Brigade chapters.